Bruce Friedrich, Farm Sanctuary’s director of policy and engagement, oversees Farm Sanctuary’s work on legislation, litigation, policy, and engagement. Before joining Farm Sanctuary, Bruce worked for two years as a public school teacher in inner-city Baltimore (where he was his school’s “Teacher of the Year”), for six years at a homeless shelter and soup kitchen in Washington, D.C., and for 15 years at PETA, where he was vice president for campaigns. 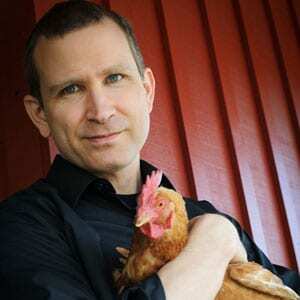 He is a popular speaker on issues of animal rights and effective advocacy, has appeared many times on CNN, Fox News, and MSNBC, and is a regular contributor to The Huffington Post. Bruce asks to please out check this video, share it on Facebook, and Tweet it: www.WhatCameBefore.com. Caryn Hartglass: Hello Everybody! Hi there everybody, how are you doing? I’m Caryn Hartglass and you’re listening to It’s All About Food. And I’m really grateful to be doing this show. You now, it’s been six and a half years! I can’t believe how time flies. And it’s just been an amazing ride doing this program. I put a shout out to everybody at Progressive Radio Network for the great job that they are doing and for giving me an opportunity to be able to speak once a week about things that I am very passionate about. It’s funny; it seems like whenever I start talking about food on this program I hear a little theme song. It’s not my theme song but maybe it should be. It’s that Mr. Softie song. How is without fail that it seems to play at opportune moments. Anyway, I look forward to one day when the Mr. Softie truck can offer all plant based delicious frozen treats and nothing else. Every time I hear that song, that’s what I think about. It’s been a little cooler these days and I’m really grateful for that. I wanted to mention that it’s important being mindful and think about what you are doing every moment and what you are saying. I realize when it was so hot that I was using the work oppressive and saying that the heat was so oppressive. Then, it dawned on me; I have no idea what oppression is. I lead a very good life. I have a lot of privilege. I have good food to eat. I am free. I don’t have a clue what oppression is. So, I don’t think that’s really a good adjective to use when I’m talking about really hot heat. It made me think about all the opportunities I have. So, when it’s really hot I can take a cool shower and cool off. I can turn on the air conditioner, which I really don’t like to use, but I do use it when its really hot and I need to just think. I’m grateful for that. Just changing that thought from “freedom” made the heat a lot more bearable. I also wanted to mention, this is a difficult one, but perhaps you heard this. Steve Meyerowitz, the Sproutman, I had him on this program, three times. He was killed in a car accident on Wednesday night. I did not know him very well; I loved talking to him on this program. I loved his energy, which popped out of this screen; popped out of my speakers. He was just so passionate, so alive and full of wonderful information. It just surprises me how sad I am to know that he is gone. If you remember the Sprout Man, or if you don’t, you visit www.responsibleeatingandliving.com and I have a little post about him. You can hear some of his interviews and keep his message and his voice alive. Steve, we miss you! Alright, let’s get to the good part of the program. I am going to bring on my first guest Bruce Friedrich. He is Farm Sanctuary’s Director of Policy and Engagement. He oversees Farm Sanctuary’s work on legislation, litigation, policy and engagement. Before joining Farm Sanctuary Bruce worked for two years as a public school teacher in inner city Baltimore where he was his school’s Teacher of the Year, for six years as a homeless shelter and soup kitchen in Washington D.C., and for 15 years at PETA (People for the Ethical Treatment of Animals) where he was Vice President for Campaigns. He is a popular speaker for issues on animal rights and effective advocacy. He has appeared on many times on CNN, FOX News, and MSNBC, and is a regular contributor to the Huffington Post. I just want to say that I am very happy and privileged to have a moment to speak with Bruce Friedrich who is, as you soon will see if you don’t already, is very articulate; very full of a very humble and wonderful person. I am glad I get to share the planet with you. Welcome to It’s All About Food! Bruce Friedrich: Hey Caryn, thank you so much for having me on and I am glad that I get to share the planet with you. Caryn Hartglass: You and me and seven billion others. But, it’s a good moment to be here and I like think that even though we are hearing about so much violence in the world today, that there are a lot of good things that we are not hearing enough about. The last time I spoke with you was back in 2011, you had just joined Farm Sanctuary. The first thing I want to know is, what’s new? Bruce Friedrich: What’s new is a really big question. We continue to work away on a wide variety of projects. I guess the two I’m most excited about are the Massachusetts Ballot Initiative. Just in Massachusetts this past weekend I’m speaking and gathering signatures. We will be putting on the ballot in Massachusetts and Initiative that will ban the worst confinement systems for farm animals. Like veal crates and gestation crates which keep the baby claves and pregnant pigs in crates that are basically the size of their body. Literally the animals cannot turn around for their entire lives. And, battery cages for egg-laying hens, which are similar to veal and gestation crates in that they keep five hens on average in a space about the size of a file drawer. So, these confinement systems are really the product of factory farming abuse and we are planning to make both the systems themselves illegal in the state of Massachusetts as well as the scale of products from these systems illegal. I had a great time this weekend gathering signatures with volunteers from the Humane League and the Massachusetts SPCA, the ASPCA, the Humane Society of the United State, and people are excited about it. People on the ground, Massachusetts citizens appear to be universally opposed to these sorts of systems. I’m very optimistic about making them illegal. Caryn Hartglass: Now this is just in the state of Massachusetts, are there other states that have already banned these things? Bruce Friedrich: Florida has banned gestation crates; Arizona banned gestation crates; California banned gestation crates, veal crates, and battery cages. That was all. Those three states banned those systems by popular vote. There are half a dozen additional state legislatures that have banned one or more of these three systems. The really big news is the Humane Society of the United States scored a colossal victory when they convinced McDonalds to phase out battery cages from their supply chain over the next ten years. And, the industry itself in the last couple of days has been realizing that is really the beginning of the end of battery cages. Those are the cages about the size of a file drawer and they confine about five hens on average. Although, oftentimes its actually seven or eight hens in the cages if the cages are being used for liquid eggs. The level of abuse is the same as if you put five or seven dogs or cats in tiny wire mesh cages, cages stacked one on top of the other for their entire lives. Animals’ muscles and bones deteriorate from their complete lack of mobility. When they are pulled out of the cages, in the best-case conditions, a third of them suffer new bone breaks because their muscles and bones have so deteriorated from not being used for years on end. And chickens actually out-preform dogs and cats on test of behavioral, emotional, and cognitive sophistication. So, just like a dog or a cat would, if they were unable to move for years on end, the animals go completely insane. These things are torture chambers and if we had this conversation just a week ago, I would not have been able to say that they are being relegated to the dustbin of history. Now as we are talking, I can. Caryn Hartglass: Well, that is good news just hearing you say all of those things about how the animals are treated. I know these things, and yet every time someone describes them it is very difficult to hear. So, this is a good thing even though it is going to take some time to phase this out. Instead, the chickens still aren’t going to be in paradise. They are still going to be confined but it is not going to be as bad. Bruce Friedrich: That’s exactly right. Unfortunately, cage-free does not even begin to approximate cruelty-free. If you look at these cage-free facilities they are filthy, the animals don’t go outside, the animals are breathing ammonia-laden air. It is bad conditions, but when you compare cage-free to cages, animals are going from really complete immobility for years on end to squalid but at least able to move around. The solution is obviously for everybody to stop eating animal products all together. But, for the hundreds of millions of animals who are currently in cages, getting out of those cages makes a meaningful difference for them. I do just want to backtrack. You mentioned how hard it is to hear these conditions explained and I could not agree more. I do think that for people who consume these products, we owe it to ourselves if we are consuming these products to actually know what it is that we are supporting. So, I would encourage people to check out a video that we put together at Farm Sanctuary. It is called “What Came Before” and it introduces you to three Farm Sanctuary animals and shows you what their lives would have been like if they were not in the sanctuary at Farm Sanctuary. It is just www.whatcamebefore.com online. It’s about ten minutes and it’s really quite eye-opening. Caryn Hartglass: It doesn’t take much but I know that a lot of people feel like they are doing something when they buy a box of eggs that says “free-range” for example, not even knowing what it means. Bruce Friedrich: You know, “free-range” doesn’t have any kind of legal requirement behind it. The vast majority of “free-range” eggs are certainly not as bad as eggs that are not labeled “free-range”, but there have been multiple exposes into the conditions for “free-range” hens and they are far short of the bucolic image othat is oftimes on the carton and that most people probably get in their mind’s eye when they think “free-range”. I would challenge people who are interested in buying eggs, and they want to buy “free-range” eggs. It’s the whole know your famer concept. I would challenge people to go find the hens and ask to see the conditions that they are raised in and my hunch is that people will be very unpleasantly surprised by what “free-range” looks like. Is it a meaningful improvement over cages? This is how over 90% of egg-laying hens are housed. Yes. Probably in every instance, or just about every instance it is a meaningful improvement over cages. Is it good conditions? No. It is probably still conditions that would be prosecutable as cruelty if these were protected animals, if these were dogs or cats. Caryn Hartglass: Bruce, you suggest people get to know their famers and where their eggs come from. That’s too much trouble! People don’t want to do that. They want easy and convenient. Bruce Friedrich: Well, vegan is new and you have to learn new habits in order to stop eating animal products all together. But, once you’ve been doing it for a little bit it becomes easy and convenient. I think one of the things about basic integrity is like Socrates said “The unexamined life is not worth living”. Examining our lives, and with regard to our food choices, examining where our food comes from. If people can’t go to the inconvenience of this thing, the farm, then perhaps those aren’t products that we should be consuming at all. Caryn Hartglass: I’m enjoying, and that’s a sarcastic enjoying term, what is going on between Hampton Foods Just Mayo product and the American Egg Board that has been getting a lot of press for doing some things that may come out as illegal actually and all of the trouble that they are going to to try and squash this new company which makes a mayonnaise like product that looks, tastes, feels, like the traditional egg product but it doesn’t contin an animal egg. It contains plant eggs. Bruce Friedrich: Yeah, its pretty interesting. For people that aren’t familiar with the controversy, the American Egg Board is a quasi-governmental agency. The members of the American Egg Board are appointed by the United States Secretary of Agriculture. The government is not supposed to be in a situation in which it is attacking American companies, and yet some emails that were obtained through Freedom of Information Act requests document very clearly that the American Egg Board is working with public relations agencies to attack Hampton Creek Foods, to bury a competing product in what looks to me like a violation of the law. There are some pretty startling emails in this correspondence including emails where members of the American Egg Board are joking about actually killing the CEO of Hampton Creek Foods. It really is quite remarkable. Caryn Hartglass: It is quite remarkable indeed. Ok, so you are in Washington D.C.? Caryn Hartglass: What’s it like in a day in the life of Bruce Friedrich? What I’m leading to is your interaction with some of our representatives and what its like to interact with them and the feedback that you get. We are all very frustrated with our government right now and how dysfunctional it is and how bipartisan it is and how it seems like nothing is getting done. How does it work for you? Bruce Friedrich: Well, I work with agencies, with the USDA more than I work with members of congress. I have had some very promising meetings with Cory Booker’s staff and he is talking about getting Dianne Feinstein’s staff involved as well with regard to regulatory work that I am doing having to do with the Humane Methods of Slaughter Act and the degree to which that is grotesquely unreinforced by the USDA. At the legislative level, I think you’ve really hit on it. The partisanship is really unprecedented and passing laws that help farm animals through the federal government was already a borderline impossible slog because everything that would help farm animals would have to get through the House and Senate Agricultural Committees. Even under the best of times, those committees are dominated by the people who are most invested and most interested in agriculture and that oftentimes means animal agriculture. Even where you would have a majority of members in both houses of congress, you need to first get a majority of both the House and the Senate Agricultural Committees to get bills to the floor. That has not happened in more than 15 years with regard to farm animal protection legislation. When it did last happen with farm animal protection legislation, something happened that I didn’t even know was possible. A bill passed the House and the Senate that would have banned the slaughter of downed cattle. And this was before that was banned through regulation in late 2003 and then solidified and improved in 2009. This was roughly 1999 or 2000 and it passed on the slaughter of downed cattle. It was taken out in Conference Committee. Wording that had made it through both the House and Senate floors was taken out before the bill was sent to the President for his signature. I think this gives you a sense of the power of big agriculture in Congress. We work primarily through state legislators and State Ballot Initiatives as well as through regulatory reform, which involves taking the laws that already exist, for example the Humane Methods of Slaughter Act and the Poultry Products Inspection Act, and trying to put some additional teeth into them. In the case of both those laws, unfortunately they are borderline toothless as a result of the USDA’s lack of enforcement of them. The laws on the books could be quite meaningful for animals in the final moments of their lives, and we are trying to align what the laws say with the actual enforcement of them. Caryn Hartglass: The USDA has a lot of problems and I hope to see it improve over time. Number one, it’s got a conflict of interest with itself where it is supposed to be promoting health and nutrition and healthy foods and at the same time it’s promoting its agricultural products. When it tells you that cheese with high saturated fat isn’t healthy for you then they also at the same time promote eating more cheese. This is a serious issue and I don’t even know how they do it. Clearly they don’t do it well. The other problem is that they aren’t funded really to enforce the important regulations that we already have. Bruce Friedrich: It’s actually sort of a little bit more nefarious then that on the humane slaughter front, because the USDA actually has money allocated by congress to do a significantly better job of enforcement then they do and because USDA just appears not to care that much about the Humane Slaughter Act, they don’t even spend the money that’s allocated to them and they don’t do what Congress has mandated that they do. There is a degree to which Congress’s lack of oversight is also a problem. But, you would expect if Congress passes a law and funds the law and creates a mandate for an agency they are just basically saying “Nah, we’re not going to do that”. I mean, that’s the situation that we find ourselves in and its something that is taking an awful lot of my time and that’s one of the things I’m trying to rectify. Caryn Hartglass: Well, we are glad that we’ve got you doing that, because there is nobody better out there that can make it happen. Caryn Hartglass: I’m behind you. Go Bruce! Bruce Friedrich: Thank you very much Caryn! Caryn Hartglass: What are some of the fun things that are going on with you and Farm Sanctuary? Let’s lighten it up and hear some of the lovelier side. Bruce Friedrich: Well the Massachusetts stuff is pretty lovely. If anybody wants to volunteer for a week or two, the Humane Society of the United States has rented a house in Boston and they provide the housing and they provide the food. And it’s a lot of fun and camaraderie and other really good stuff. That’s pretty cool. We had our ho-down last month. We have the ho-down in the first or second week of August every year. It’s a big party, 250 people come together. We have our big gala honoring John and Tracy Stewart, both of whom are going o be there in New York City next month. Senator Cory Booker from New Jersey is going to be there presenting John and Tracy Stewart with humanitarian awards, so that’s an awful lot of fun. We published our Someone Project and that is running strong. We published paper on the complex emotional, behavioral, and cognitive lives of fish and pigs and are just submitting our chicken paper to the Journal of Animal Cognition. Lots of fun interesting things and people can check out all of it online at www.farmsanctuary.org. We love visitors and the animals love visitors. Upstate New York is a really nice place to visit. Lots of wineries, lots of great hiking, and Farm Sanctuary is there in Watkins Glen. If anybody is anywhere near the area, we certainly invite them to come and take a tour and meet the animals when you are doing other fun stuff up there. Caryn Hartglass: As we go into the fall season, in my opinion, it’s the best time to visit upstate New York. My favorite time and my favorite place. Bruce Friedrich: Yeah, really beautiful. Caryn Hartglass: Can you give us a little taste of what is in the behavioral study with fish? The cognitive behavioral study you had just mentioned? Bruce Friedrich: Sure! Fish have long-term memories. They remember other fish for at least two years. They remember the faces of other fish. I don’t know about you but I can’t do that with human beings, but fish can do it with one another. They remember if they have been netted and released in a certain spot. They have the capacity to remember where it was that they were netted and released. A fish school is an awful lot like a pack of wolves. When the scientists are looking at the complexity of the behavioral relationships of fish, there is the alpha fish that sort of runs the pack and they have complex interactions and mating rituals. Ecology is just the study of emotion, behavior, and cognition in animals. With regard to all of the ecological work that has been done across species, it is pretty nascent in fish and farm animals relative to great apes and cetaceans and elephants and dogs. But, what exists is extraordinarily intriguing and we have it distilled in the education section of our website. If you go to www.farmsanctuary.org in the top navigation you’ll see “Education”. If you hover there you’ll see “Someone Not Something” and you can click on that and see a species by species distillation of all of the interesting stuff that scientists have discovered about farm animals. Caryn Hartglass: I think at this point I am the most fascinated to learn about fish just because I know land animals feel and think and love and want to be with their families and pursue their lives and their freedom. It’s easier to relate to mammals because we are mammals. It gets more difficult to really empathize with other living species that don’t look anything like us, especially the ones that don’t even live in the same environment, living underwater. I know that there is so much going on there and just one of the reasons I won’t eat them: fish are your friends, not food. That’s my favorite line from the movie Finding Nemo. I say it a lot. Bruce Friedrich: Sylvia Earle is probably the foremost living marine biologist. I think if she were male she would be a well known as Jacques Cousteau. She talks about the complex emotions and cognition of fish. She had a really great line, she said “Fish are interesting. They are individuals. I’d no more eat a fish then I’d eat a cocker spaniel.” In some areas fish outperform dogs on some of these tests. I would encourage people to check out the “Fish” section of our Someone Project website which is titled “Meet the Animals: Fish” and you can either get their through www.farmsanctuary.org or you can search “Meet the Animals: Fish” and it will pop right up. Caryn Hartglass: Wonderful, there is a lot of great information at the www.farmsanctuary.org. Farm Sanctuary has been at this for a long time and the information just becomes more fascinating and compelling. We do have a few more minutes left and I just want to say, Bruce I haven’t seen you in a while but in your pictures you are looking fit and fabulous as ever! Bruce Friedrich: That’s so nice of you Caryn and absolutely the same about you. As I was getting ready for this interview I was surfing around and you haven’t changed at all in the last fifteen years! Caryn Hartglass: Thank you. Well, first of all I’m alive and I’m grateful to be alive. You know there was a moment there in my life where it was questionable. But, I’m over that hump and I’m grateful for that. I think we’re not getting older, we are getting better. You are a big runner right? Bruce Friedrich: I’m not. I kind of trashed my knees so now I’m a big bicyclist. I ride my bike generally 15 or 20 miles a day. When I go out for anything approximating a long run, I am hobbling for a couple of days afterward. But it seems like I can ride my bike indefinitely without any problems. I don’t know what the deal is there. I’ve gone from running to biking. Caryn Hartglass: Okay, I’m sorry to hear about your knees, but you know that’s the thing about being human. We are vulnerable no matter what we do. And the other thing I wanted to know is what you are eating these days? Bruce Friedrich: What am I eating these days? Well I had chickpeas and rice and fried kale for lunch with my wife, who is a phenomenal cook. So, that’s what I had for lunch. For breakfast we had smoothies and potato pancakes. Caryn Hartglass: Nice, that sounds pretty good! I did want to ask you about Dr. Alka Chandler and see how she was doing, so I’m glad you mentioned her and I love the work that she is doing at PETA as well. Give her a hug from me. Bruce Friedrich: I definitely will. She sends hugs back to you Caryn. Caryn Hartglass: Very good, well Bruce it has just been a delight to have you on and hear all of the wonderful things you are up to and I know you are going to continue and do even more. Thank you very much! Bruce Friedrich: Thank you very much Cary and thank you for your lovely radio program and inviting me on to be a part of it. I really appreciate it. I hope our paths will cross in person very soon. Caryn Hartglass: Yes, I do, I hope that. Okay, take care! Lots of love! Bruce Friedrich: Thanks, you too. Caryn Hartglass: Bye! That was the amazing Bruce Friedrich and as he was mentioning all the different resources you can discover at www.farmsanctuary.org I really hope that you check some of them out. Especially if you know you are discussing with other people who aren’t as open and receptive about this idea about eating plants. There is a lot of great information there that will help you fuel your conversation. I don’t want to say argument because I want to keep it positive and light but its good to have a lot of information at your fingertips so you are confident about what you are talking about. As we learn that fish are your fiends and not food, sometimes it helps to have these cognitive behavior studies at your fingertips. All right, lets just take a very brief break and I’ll be back with my next guest!